When you need expert service for glass, mirrors, and more, contact our specialists! We are your residential glass repair and installation specialists who can offer professional services for mirrors, windows, and so much more! Our specialists are able to install, repair, and replace bath and shower enclosures in your home that will enhance the aesthetic of your bathroom. From customizing windows for your home to repairing windows, we offer high-quality and affordable services for your windows. Installing glass shelves in your home can add a unique touch, as well as add an accent to several spaces in your home. Whether you need your skylight repaired or a complete replacement, our window specialists are able to help you. There are many ways that glass is able to increase the appearance and value of our home’s. From adding glass shelves to your living room to installing glass table tops to protect your furniture, glass can boost the protection, aesthetic, and worth of your home. However, there are times when glass in our home’s needs to be repaired. When you need glass repair in Fort Worth, TX, you can depend on Armstrong's Glass & Mirror to help you. At Armstrong's Glass & Mirror we are professionals when it comes to glass repair and window replacement. It is our goal to not only provide the best in quality products and service but to also provide the highest level of customer service. We take the time to talk with our clients about the best ways to get the product they desire at the best possible rates. Call us at 817-937-6267 today or request a free estimate online. We always look forward to hearing from you. 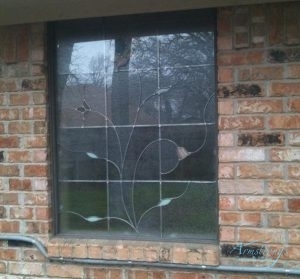 We serve all our Fort Worth, TX residential glass repair and replacement customers with a smile. Our Technicians Can Also Perform Glass Replacement and Other Glass Services. In addition to our glass repair services, we also offer glass replacement services, as well. There are many reasons you might need glass replacement. You might need the glass in your window replaced or even a glass item, but whatever the reason, we’re happy to work with you on same-day replacement if at all possible. We are used to people needing glass replacement after an accident or disaster, such as children playing, rocks flying, bad weather, or even break-ins. At the very least we will have your window boarded up, if necessary, to ensure your safety while we work out our replacement service with you. These are the types of glass repair, replacement, and installation services we offer our customers. Broken Glass Repair If you have a broken window or another broken glass item in your home, just give our technicians a call today. 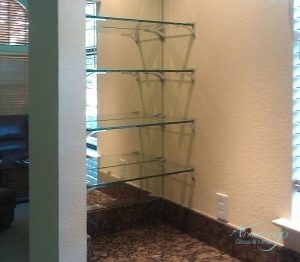 Glass Shelving Installation Want to add glass shelving to your living room or office? We offer affordable and high-quality glass shelving installation. Glass Table Tops A great way to protect your dining room table, coffee table, and more is by adding glass table tops to your furniture. Insulated Glass Repair Foggy and milky glass can give the appearance of a very dirty window; insulated glass repair can alleviate this issue once and for all! If you need glass repair in Fort Worth, TX or another glass service, feel free to call our glass specialists at 817-937-6267. 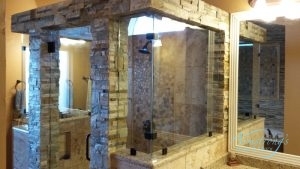 We Are Able to Customize a Range of Bath and Shower Enclosures. We consider glass to be one of our biggest specialties, so naturally, we offer custom bath and shower enclosures for our customers. Our bathrooms are more than just a place for us to get ready; they are also a great place for homeowners to relax and decompress at the end of the day. On top of them being a central room in our homes, they are also one of the most popular rooms that people look at when buying a home. If you are thinking of putting your home on the market or you want to upgrade your bathroom, a great way to do this is by installing bath and shower enclosures. A popular shower enclosure that is able to add more value to your home is frameless glass shower doors. They are easy to maintain and will elevate the look of any bathroom. Although our expertise lies in frameless glass shower doors, we also offer other shower and bathtub installations. Coastal Framed Shower Installation Coastal Framed showers are quality shower doors that can add a luxiorious feel to your home’s bathroom. Frameless Shower Glass Want a shower that is not only easier to clean but only makes your bathroom seem bigger? 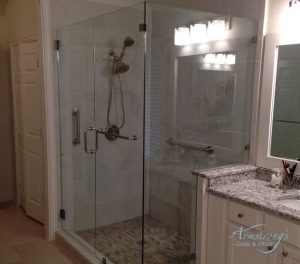 Consider a frameless glass shower door. Handicap Shower Installer Our company can install easy-access showers whether you have restricted mobility or you are a senior citizen needing better access to your shower. Don’t hesitate to call us at 817-937-6267 if you’re looking to remodel your bathroom and would love to deck it out with a frameless glass shower. We are more than happy to set up a consultation for bathtub and shower glass installation and glass repair in Fort Worth, TX. Interested in Installing Specialty Glass in Your Home? Call Our Technicians! Glass, whether it’s shelving or windows, can add a unique touch to any home. At Armstrong's Glass & Mirror we offer specialty glass services like installation and repairs to different types of glass in your home. We work with various types of specialty glass, including pattern, tinted, and frosted glass. Each specialty glass is able to add different design elements to your home. If you are interested in adding patterned glass windows or maybe you want frosted glass in your home for privacy purposes, our glass specialists will set up a consultation service to assess the aesthetic of your home and decide what type of specialty glass will look best. From there they can draw up a personalized plan that is customized to your specific needs. Get in touch with us today for specialty glass installation or glass repair in Fort Worth, TX by calling 817-937-6267. Our Company Offers Skylight Repair and Replacement Services. Skylights are a great way to add more natural light to your home, as well as incorporating a unique touch to your home. However, because Texas has times where there is severe weather, skylights can become damaged by powerful winds and hail. When this happens, you need the assistance of technicians who have the skills and experience to offer skylight repair service. Fortunately, the technicians at Armstrong's Glass & Mirror can help! Whether your skylight is leaking or foggy, we have the tools and materials to get it fixed in a timely manner. On occasion, a skylight repair might not be the most cost-effective solution. 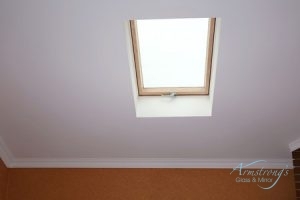 There are a few reasons for this, such as frequent repairs, so if we think that repair service won’t be able to fix your problem, we will recommend a skylight replacement. Our technicians will walk you through the process and ensure you that whatever type of service you need, we will be able to give you a skylight that is in better condition. Give us a call at 817-937-6267 for skylight repair or replacement today! Our Technicians Can Install, Repair, and Replace a Variety of Windows Like Low E Windows. Double Hung Window Replacement If you have double hung windows in your home that need to be replaced, give our technicians a call today! 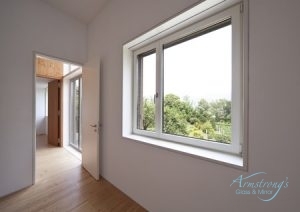 Single Hung Window Replacement For homeowners who need single hung window replacement service, look to our specialists to help you. Solar Screen Installation Block heat out of your home and harmful UV rays that can ruin your furnishings with a solar screen. Vinyl Window Repair Do your vinyl windows have cracks or are leaking? For quality vinyl window repair, call us! Window Repair Whatever type of window you have in your home that needs to be repaired, you can count on us! Get in touch with our technician today if you need window glass repair in Fort Worth, TX or other window services when you call us at 817-937-6267 today. From Vanity Mirrors to Mirrors Behind Shelves, We Have Many Mirror Installation Services. There are times when we get tired of the way a room looks. Either it needs to be remodeled or just needs a few updates, an easy way to give any room in your home a boost is by adding mirrors. Not only are they an affordable alternative to a complete remodel, they are able to make any room look larger and give it an entirely new look. If you are interested in installing mirrors in your home, our technicians can help! We are able to install many types of mirrors such as complete mirrored walls, vanity mirrors, customized bathroom mirrors, closet mirrors, and more! Our customizations include adding different types of edging like flat polish edge, beveled polish edge, pencil edge, and seamed edge, as well as tints. Whatever kind of mirror you want, we can work with you to cut it to your specification, customize it, and install it. Just give us a call if you want mirror glass installation or glass repair in Fort Worth, TX. 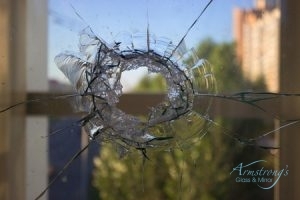 Contact Armstrong’s Glass & Mirror Today for Glass Repair and Other Services! Since opening our doors, our owner, Mike Armstrong, has wanted to provide high-quality and affordable glass and mirror services for customers in the Fort Worth, TX area. We are proud to say that we continually provide the best glass, mirror, window, and other services that offer exceptional prices with superior results. We want our customers to have the very best in glass and other services, so we will sit down with them and figure out what will offer more value and an improvement in their home. We will educate our clients on the options with no pressure or gimmicks. We want to provide the kind of honest work that will leave no doubt that you got much more than you paid for. 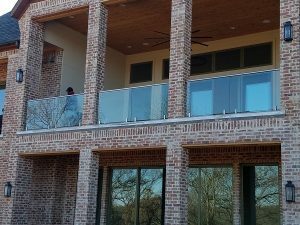 We are as much known for our great customer service as for our expertise in glass replacement and glass repair in Fort Worth, TX. Our company takes pride in that. When you want a company that will always go the extra mile for you, give us a call today at 817-937-6267! We can either set up an appointment time or give you an estimate on a specific service. Updated on January 14, 2019 at 3:46 pm by Armstrong Glass.